Louisville Slugger is a big name in baseball, but mostly for their bats, not their leather. A Louisville Slugger catcher’s mitt is an off-beat choice for most players accustomed to the usual Wilson and Rawlings offerings, or some of the more exotic gloves now on the market; but the Pro Flare glove’s interesting design might be just the ticket for catchers that are having trouble handling their duties behind the plate with a more traditionally designed glove. The Pro Flare looks different than many other mitts, and not only because of its soft, oil-infused jet-black appearance. It’s set up to catch differently than other bowl shaped mitts. The Louisville Slugger Pro Flare has the kind of look you’d expect to see out playing the field. It’s made from supple leather that’s infused with oil at the factory to make breaking in the glove an afterthought. The Gaucho leather is thinner and more flexible than many mitts, and if you’re the type of catcher that has trouble closing a mitt quickly enough on fastballs, this glove can elevate your game with just a change of glove. While it’s technically a standard C shaped mitt, its huge pocket is anything but a half moon. The Pro flare is designed to accept the ball in the pocket instead of the center of a bowl of leather like many mitts with small pockets and heavy padding. If you’re an inaccurate judge of incoming pitches, you might find the Pro Flare tougher on your palm than more heavily padded gloves made from tougher steerhide; but used to its full advantage, the big pocket can handle most pitches away from the palm and keep your hand fresher longer. 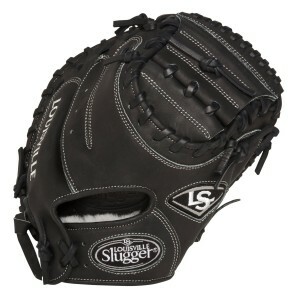 It swallows many pitches that would bounce off other gloves. If you’re used to the bright orange or yellow leather steerhide that gloves like the Wlison A2000 or some of the Rawlings models use, the silky black look of the Pro flare will seem more like an expensive car seat than a catcher’s mitt. 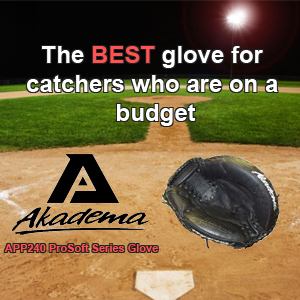 It’s built to be comfortable right away, and it achieves its comfort not only by being so supple, but also by allowing the catcher to handle the ball away from the palm much more than other mitts. The glove looks a lot like a really big fielding glove, and many players that share time between plate duties and first or third base will appreciate the difference between the Louisville Slugger Pro Flare and conventional designs when making the shift back and forth. The Pro Flare isn’t like other gloves, so if you’re dissatisfied with more conventional mitts, maybe it’s the perfect glove for you.